Boring old plain brown frames . . . Painted them my fav color of beachy blue. And usually I just sell them like this. Which is fine, and they ALWAYS sell quickly. 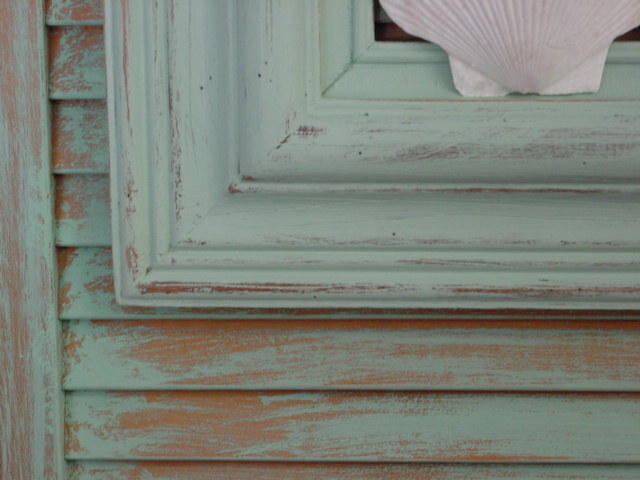 But I’m readying product for a special trunk show at a friend’s shop and I wanted something NEW and exciting to offer. I was trying to think of something that could be hung in the center of the frame. Oh! OH !!! OH!! I have a few BIG shells that I got at a rummage sale a while back! I wonder if they’d fit?!?!? 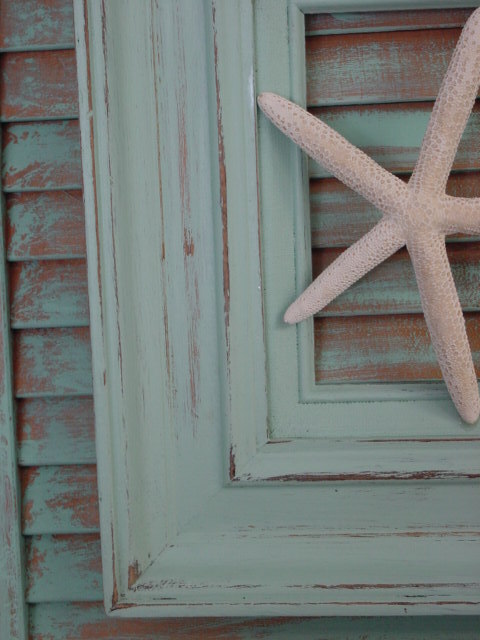 To say that I LOVE how these turned out (especially THIS one with the starfish, my ONLY starfish!) is a total understatement. This is in the ‘top ten’ of my most favorite things I’ve ever created. Maybe even at the TOP of the top ten! I just used some e6000 adhesive to attach the shell to the frame. 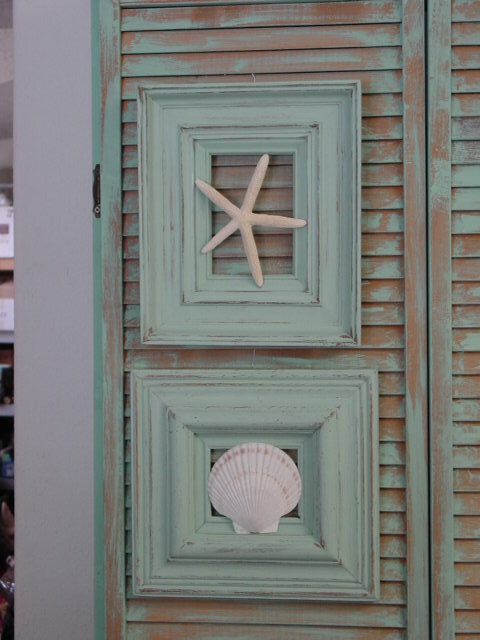 I have a few more of thee scallop shells, but that starfish was my ‘one and only’. I’m hunting for more, if anyone has a good source for buying them they’d care to share with me. I’ve been searching the net for weeks for starfish. 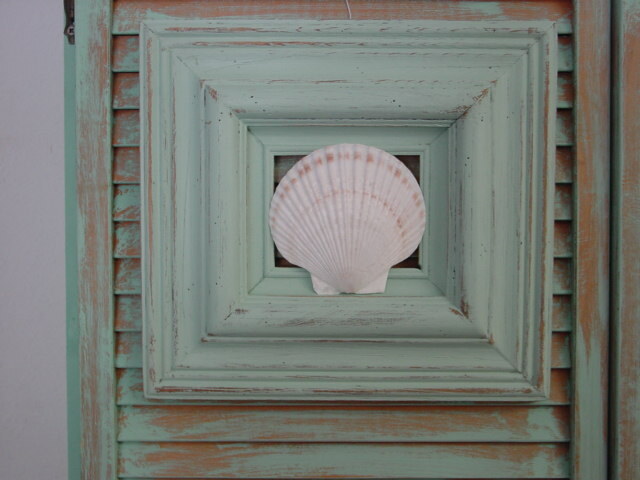 I want some BIG ones to frame and some little ones to add to my little ‘candy’ boxes of shells and sea glass. 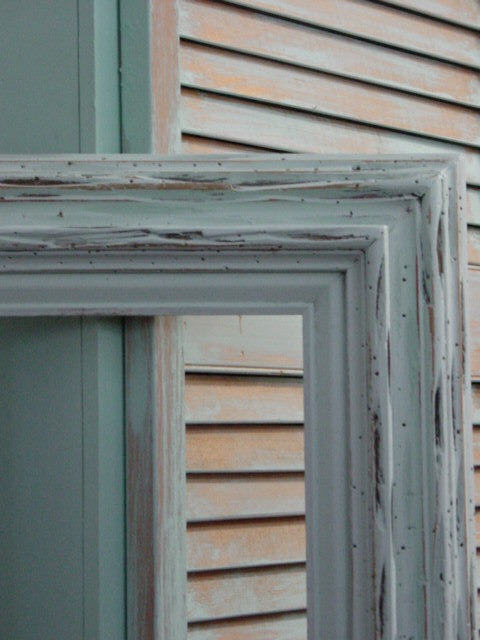 I’m on the hunt for some more frames like this too; thick sided with small openings. Definitely at the TOP of my top ten favs! This site has starfish from 2-10 inches. Oriental Trader also has them, but they aren’t very big. I actually mix my own to get just the right color, but I don’t have an EXACT recipe that I can share. 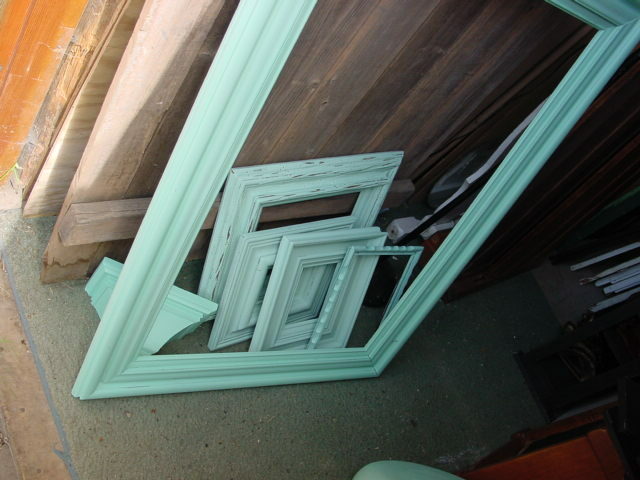 I buy the color that is closest to what I want, then add a little more turquoise, green, white or gray as it suits me for the specific project. So I never really even have the EXACT same color ALL the time. It kind of evolves . . .which I like. I don’t like thing to be PREFECTLY matched. Very cute! 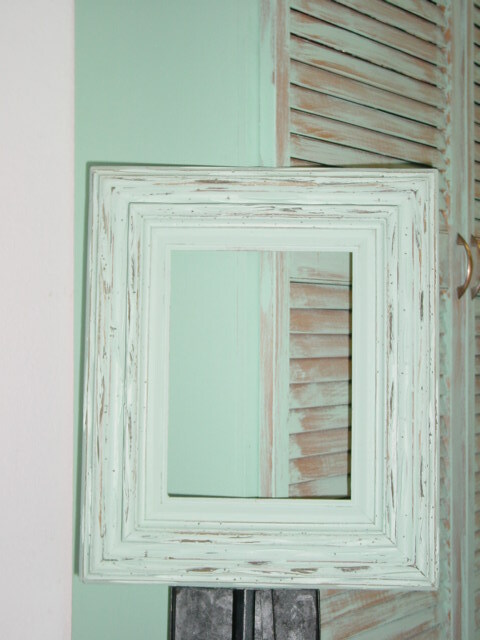 Loved how you reused! 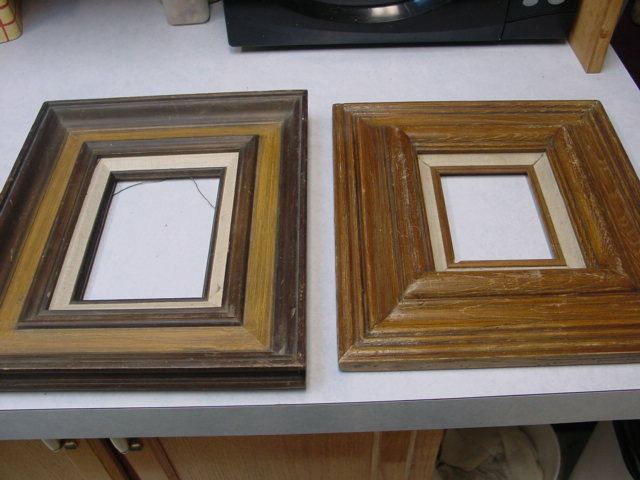 I have some old frames and now I know what I’m going to do with them! Thanks for the great Idias! Go to SHELLWORLD.COM Lots of 6-8″ starfish some $2.49 ea. others are $4.99 ea. I checked out this site, and while they DO have a HUGE variety of shells, their prices are pretty HIGH for buying in bulk and to use for crafting. 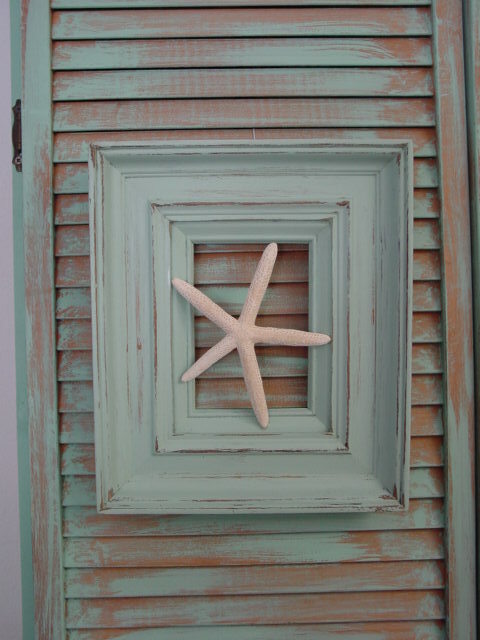 i got a starfish and several shells about the size of yours at pottery barn a couple of years ago. i”m betting they probably still have some! How do you distress them? Kinda new to all this? I hand sand with coarse sand paper. Check TJ Maxx. The regularly have bags of starfish, maybe 10 for 12.99.